Advent begins two weeks from today! This weekend I spent a little time sorting through our Christmas books to fill this year's Advent Book Basket. I love that Christmas falls on a Sunday this year and we will all be able to enjoy FOUR COMPLETE WEEKS of Advent this year, the longest Advent possible! Advent varies in length from 22-28 days, beginning with the Sunday nearest to the feast of St. Andrew the Apostle (November 30th) and embracing four Sundays. The first day of Advent can fall as early as November 27th or as late as December 3rd. 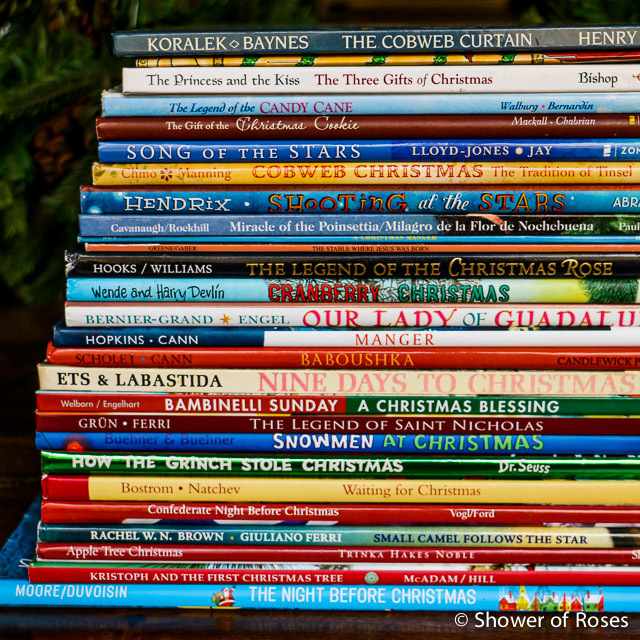 In the past I have filled our basket with Christmas Mosaic titles and our children's 35 Favorite Christmas Picture Books. Last year I pulled out twenty-six of my favorites to wrap up. This year I was having a really hard time choosing -- way too many options -- so I asked my husband and oldest daughter to help pick out twenty-eight books for this year. 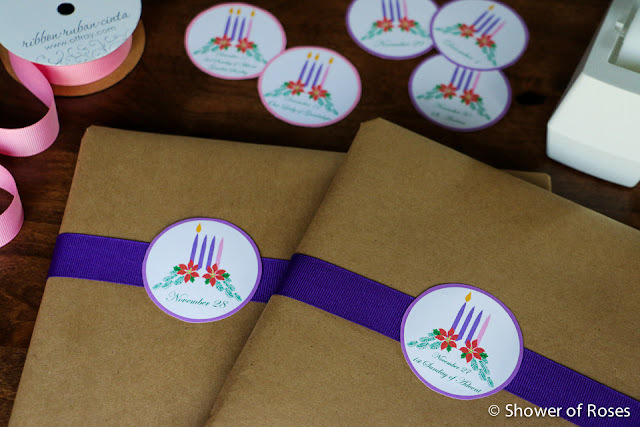 A couple years ago I switched to brown paper, instead of the purple and pink wrapping paper, along with purple and pink ribbon (which I saved to re-use again this year) and homemade labels for each day. I love it! So simple and pretty. If you'd like to use my little labels too, you can download my Advent Book Basket Labels for 2016 over at Dropbox. As always, we'll unwrap and read one book each night during Advent, following our family rosary. 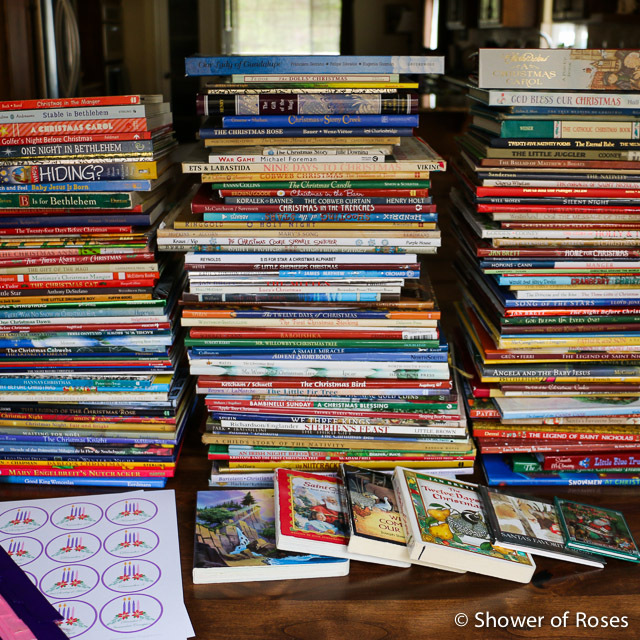 The rest of the books will be placed in additional baskets for the kids to read whenever they'd like during the seasons of Advent and Christmas. Here's the link to my Christmas Mosaic Review and the Featured Booklist. I'm hosting giveaways every weekend of November this year, leading up to the first Sunday of Advent on November 27th. 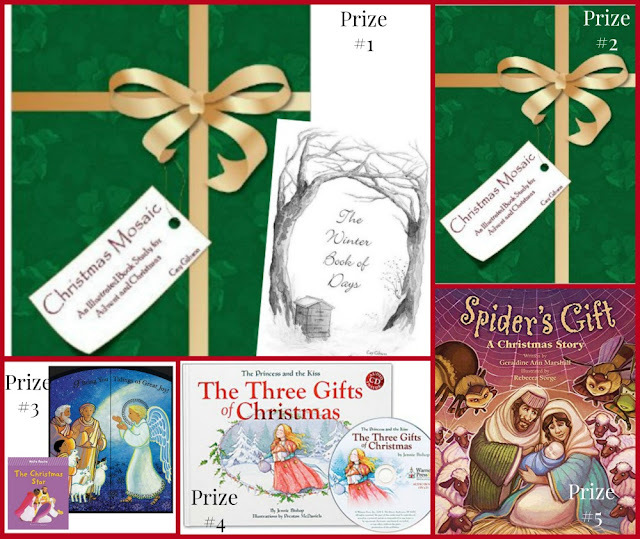 This weekend I have five prizes to give away, all perfect to help build your own family's Advent and Christmas book collection! There is still time to enter the St. Nicholas Giveaway if you haven't already! You can find the rest of our booklists here.